Dolma Kyab is a rising young singer from Amdo. 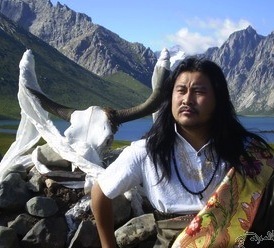 He became very famous for the song, ‘Tibetans’ (or ‘People of the Land of Snow’ གངས་ཅན་པ།) several years ago, since which time he has worked with other Tibetan writers to produce a tremendously powerful album called, ‘Tsampa and Fatherland’. He explains that growing up in the grasslands of Tibet, hearing beautiful Tibetan music, led him to a career in Tibetan musical art. His songs evoke pride and love for Tibet and Tibetan culture. Whose dream was robbed and where? Whose small shoes were withered by the wind? I am stuck to you when I grow old. Oh how I wish for them to return. Whose wish was robbed and where? Whose base is tightened by freeze? Whose neck (voice) was choked? – Download the lyric for Phayul (ཕ་ཡུལ།).